Bring Sera with you to recover the Red Jenny caches across the various regions for additional "slight approval" points. These can come in handy—especially if you made certain "elfy" decisions at other parts of the game. Note: These caches are only findable if Sera is in your party. Red Jenny caches can help you repair your friendship. 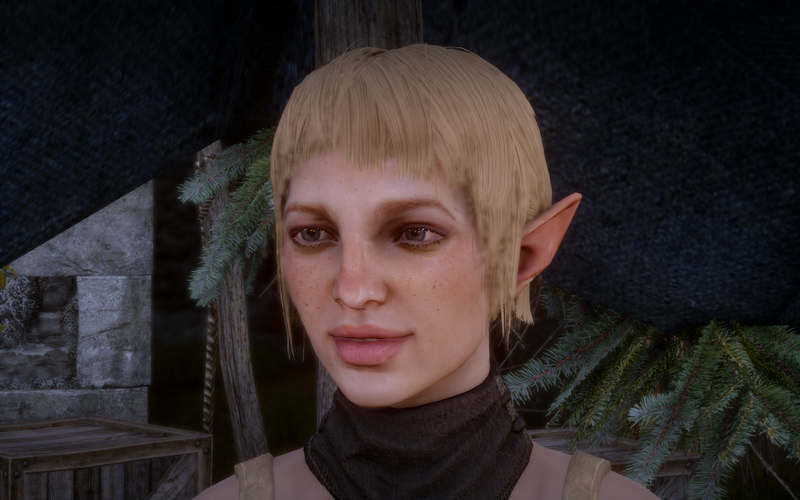 You can also get an extra quest with Sera if you bring her along to "Wicked Eyes and Wicked Hearts" which is already worth doing simply so that you get to hear her introduction in the palace—which is typically, wickedly Sera (and hilarious). Lord Trifles Minutiae and "The Quizquisition"
Lord Trifles Minutiae is an odd character who appears around Skyhold, and who will immediately question you on trivia relating to Thedas. If you answer three questions successfully, you will be awarded "The Boon of the Spoon" as a prize. At the top of the mage/Templar tower. In the last of three rooms that are accessed from Vivienne's quarters (for this location, you must have progressed far enough in the main storyline for the scaffolding blocking the way to be removed). Wear the Token of the Packmaster to become Lord of the Wolves! Check out the Dragon Age Wiki for the list of questions and answers Lord Minutiae usually asks. 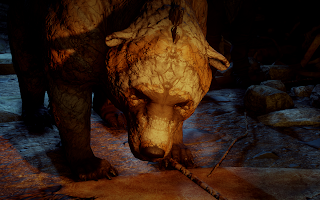 The Token of the Packmaster is an amulet in Dragon Age: Inquisition that is dropped by the Lesser Terror Demon you fight during the Hinterlands side quest "The Trouble with Wolves." It's one of my favorite little perks of the game because—if you equip it to your character (I personally like putting it on Solas for... reasons), the wolves you encounter across Thedas will not only not attack your party, they will help you in your fights. The only downside to the Token is that I've found it to be pretty buggy and inconsistent. You can ensure that it's working by unequipping and re-equipping it each time you fast travel to a new area. 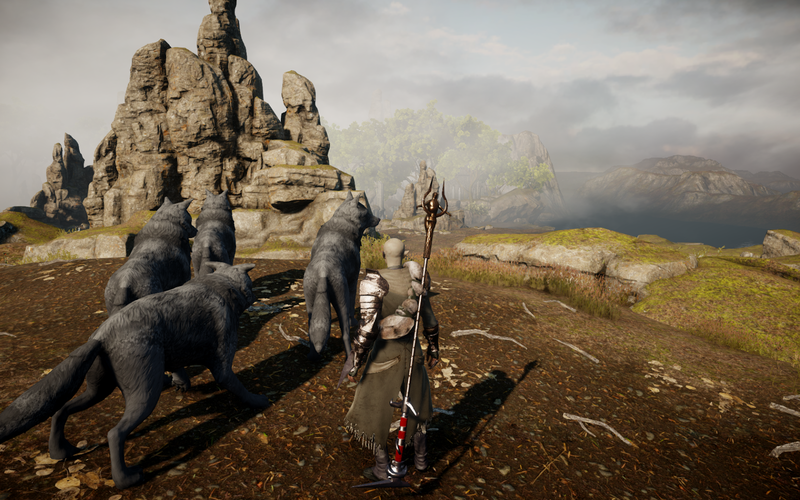 I've found that sometimes the wolves will still show up as foes (red dots) on your map, but they'll approach you and won't attack. You'll know when the Token's power is working because the wolves' eyes will glow a bright green. The "Ardent Blossom" Helmet, or "Flower Crown," is a wonderful hidden quest item that takes real effort to acquire. You'll have to trigger the quest by going to the small rock formation hidden behind some bushes east of Direstone Camp in the Emerald Graves. It's a short way east of the river, and not far from a mural. Once you find the tiny cave formation (which has flowers around and in front of it), jump on top of the rocks about fifty times, until you hear a voice. If you run away and come back, you'll trigger more dialogue. Keep talking to it until it says "Need more!" and then "The Tiniest Cave" quest will show up in your quest journal. Gather the Crystal Grace it requires until the voice tells you it's enough, and directs you "down the stairs." Then go to the secret passage under Suledin Keep in Emprise du Lion (entrance to the South side of the Keep). Go up the plank of wood, through the tunnel and down the stairs, and you'll find a chest containing gold and the "Ardent Blossom" helmet. Upon your arrival at the Storm Coast, after speaking with Scout Harding about the Blades of Hessarian bandits, you'll be confronted with some bandits to fight. Go south, and in a shack at the top of the hill, you'll discover the bodies of several dead Inquisition scouts, as well as a "Bandit's Notes" that talks about the Mercy's Crest, an amulet you can Requisition. If you craft Mercy's Crest and then wear it when you approach the main bandit stronghold on the Storm Coast, you'll only have to fight the group's leader. The rest of the group will instantly pledge loyalty to you, and from then on, you will find them throughout the hillsides of the Storm Coast, fighting darkspawn, Templars and Venatori on your behalf. This will also open up additional War Table missions, as well. You can purchase several codexes you may have missed from previous areas of the game by purchasing them from the book vendors in Redcliffe (not far from the docks) or Val Royeux (the upstairs book vendor at the end of one of the halls). 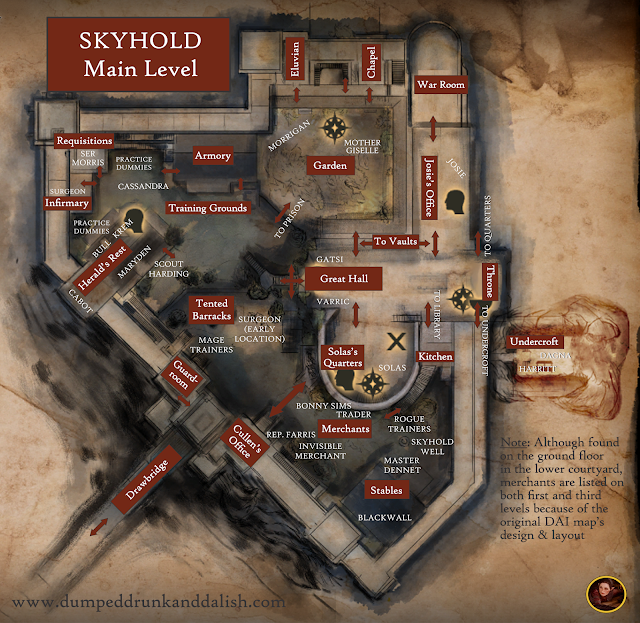 There's an occasional glitch where you may enter the Undercroft and fall down beneath Skyhold into a creepy no-man's land. Before you exit and restart the game, look around. It's a kind of a cool area, and yes, there's a jack-o'lantern there as a joke by one of the devs. There's one on the left-hand upstairs wall in Caer Oswyn, where you take Cassandra in the quest "The Promise of Destruction." In The Hinterlands, near the Crossroads, you'll find a small circular hut near the back of the town. On a table are a Healer's Notes that seem to be written in the style of Mass Effect's Dr. Mordin Solus, the wonderful fast-talking salarian scientist. Random cheese wheels can be found all over locations in the game. Explore the areas in Crestwood and you will come across chunks of cheese here and there. Meanwhile, you can also loot a cheese shield, "The Wedge of Destiny," if you go to the top of one of the hills in Crestwood. It's on a table near a cart, just West of the Three Trout Farm Camp. In the Fade section of the questline for "Here Lies the Abyss," travel to the water's edge and go all the way left. You'll find a graveyard with graves for all of your companions—and on each tombstone is the name of a Companion and their greatest fear. you've drunk from the Well of Sorrows. If you drink from the Well of Sorrows, you'll not only get some creepy and hidden dialogue that may disclose secrets about Mythal, but you'll also go into the "Trespasser" DLC with a huge advantage, as the Well's abilities mean that you will be able to talk to the ancient elven spirits (and never have to fight them). Pick up the Fragment of Inadequate Chain Mail on the dragon island off the Storm Coast. Give it to Dagna, and she'll create the "Victim of Fashion" amulet. The stats are hilarious: +1 Cunning, -100% Magic Defense, -100% Melee Defense, and -100% Ranged Defense. So basically: Don't wear it. But if you do, I suggest plaidweave. Lots of plaidweave. The Sulevin Blade is a powerful sword obtained from completing the quest "Ruined Blade." Start the "Ruined Blade" quest by reading the elf's journal found on a corpse in the camp slightly Northeast of Valeska's Watch, near the edge of a cliff in Emprise du Lion. Complete "The Ruined Blade" and that should trigger the War Table operation "Rumors of the Sulevin Blade." Complete that operation, then travel to the Cradle of Sulevin and gather the weapon fragments from all four altars. Then bring the fragments to Dagna and ask her to repair the sword. This will complete the quest and provide you with the Sulevin Blade. Fifth Blight, and he told her she was pretty." 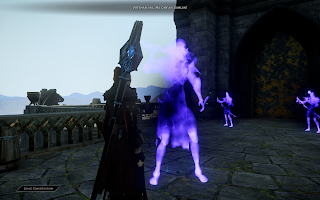 There's a reason Solas knows the way to Skyhold—it was once his home, and in fact may very well have been the site of where he created the Veil, where he imprisoned the mages he was fighting against—and where he left for the Fade. The Archivist in "Trespasser" notes: "After he held back the sky to imprison the gods, the Dread Wolf disappeared." Solas also further confirms this in his final conversation with a low-approval Inquisitor in "Trespasser." When an antagonistic Inquisitor thanks him (sarcastically) for Skyhold, Solas responds, "Enjoy it while you can. It was mine once." This also adds poignance to the fact that Solas is in fact painting the story of the Inquisition's accomplishments on the walls of his own castle. If you rescue Storvacker the bear in "Jaws of Hakkon," don't miss Storvacker's hilarious Codex entry (which is also a fabulous reference to the film Mean Girls). Looking for more Easter eggs and secrets? Check out Part 1 of my rundown of secrets here.